Erica Jong’s quotes have often focused on women and their empowerment in society. Her famous 1973 novel, Fear of Flying, was seen as a significant voice of the feminist movement, especially in the general advancement of the notion of women exploring their sexuality. Erica Jong’s quotes, particularly those drawn from this novel, have therefore inspired many women around the world to shed old conservative notions of the place of women in society. 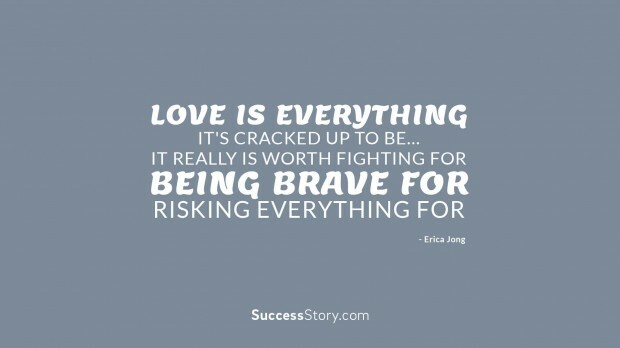 "Love is everything it's cracked up to be It really is worth fighting for, being brave for, risking everything for "
In addition to her novels, Erica Jong’s quotes are also drawn from her poetry as well as works of non-fiction. She has won numerous awards for her writing, most notably the United Nations Award for Excellence in Literature (1988). Her own personal life, as reflected in her biography, reflects the idea of a free, intellectually capable, and empowered woman expanding the boundaries of women achievement in society. Due to these qualities and achievements, Erica Jong has a considerable following and fan base. She has overcome criticism of her works to build a successful career in writing, while advancing feminism. She expresses most of ideas in her quotes. She believes that women should be comfortable with themselves, how they look, and how they feel, and that they should not conform to societal expectations that hold them back. She also believes that parents should give their children, especially daughters, freedom to explore and find their places in society without limitations. Erica Jong has spoken a lot about love in her work, saying that love is worth fighting for.